Medicine lately has diversified into various specialities and subspecialties. Like in other fields of specialization, oncology has also diversified into oncology and haematology. When something goes wrong with your blood, it can impact your entire health. In lieu of this, it becomes important for us to have knowledge about blood and different fields it entails. People may be affected by various types of blood conditions and blood cancers. Common blood disorders include anaemia, bleeding disorders such as blood clots, haemophilia and blood cancers such as myeloma, lymphoma, and leukaemia. Haematology is the new emerging branch of medicine that deals with the study of the cause, prognosis, treatment, and prevention of diseases related to blood. Q.1.What is the difference between haematologist and oncologist? Before we differentiate between oncology and haematology, we need to understand why so many different varieties of doctors are required. The answer to that is, there is a plethora of scientific knowledge which has accumulated over past many years which is very difficult for any single person to keep abreast with and to save people that scientific knowledge comes handy because every life matters and we need to understand that. In this country, haematology is 18 years old because, for the first time in 2001 D.M. haematology was recognized and first candidate passed out of CMC, Vellore. As a sub-specialization of internal medicine, we deal with blood, blood cancers, and bone marrow transplant appropriately designated as haematologist, hemato-oncologist and bone marrow transplant specialists. Let’s differentiate between these three terms which we have spoken, haematology, hemato-oncologist and bone marrow transplant specialist. Medical oncology deals with cancer, a well-established entity over the past hundreds and thousands of years because in mummies also we have found out breast cancer and colon cancer. Medical oncology also deals in blood cancers but out of a total of about 250 types of cancer, only 25 types of blood cancers are there. Medical oncologist also deals with solid tumours’ like breast, colon and prostate cancers and as we go ahead an American model will ultimately be established in our country. Accordingly, Medical oncologists in the future may be termed as breast cancer specialist, colon cancer specialist and a prostate cancer specialist depending upon their field of operation. Haematology has grown by leaps and bounds in the past 18 years which can be estimated by the fact that according to one survey as many as 2000 articles pertaining to the speciality get published in a month.A haematologist deals with all diseases of blood including anemia, thrombocytopenia, pancytopenia, haemophilia, thalassemia. The prevalence of Blood disorders in India is huge.About 55% of people in this country are anaemic. We are the third largest country in the world to have blood cancer patients which includes myeloid leukaemia, lymphomas and so on and so forth. We also deal with hemato-oncology which is as an overlapping domain with medical oncology. In order to deal with multiple myeloma, lymphoma, acute myeloid leukaemia (AML) acute lymphoblastic leukaemia (ALL), the only difference is that you have to more intense approach and you require more prompt action as compared to breast cancer or colon cancer. By prompt approach I mean like at haematology centre like us, we have an institute of blood disorder for the first time in the country where we have an end to end care. A person who comes with a blood cancer, an appropriate, personalized medicine can be delivered under one roof in terms of haematology care. We also carry out a bone marrow transplant in our centre. In a nutshell, anything from anaemia to bone marrow transplant(BMT) to lymphoma, myeloma, thalassemia, sickle cell anaemia, aplastic anaemia and other rare bleeding disorders is what comes under the domain of a haematologist. Q.2. What are the career options in haematology? So, in this country, there were only two centres initially which were awarding D.M. out of which one was AIIMS and other was CMC Vellore. But with the passage of time many more new centres have come up but the question is whether we should opt for becoming a haematologist, hemato-oncologist, and bone marrow transplant specialist or not. The answer to that is yes, and I will tell you why because as I told you 55% of the people in India are anaemic. So you require a scientific way to tackle and eradicate anaemia and for that you require a haematologist to run an anaemia free campaign. Moreover, we have the 3rd largest population of blood cancer patients in our country who require bone marrow transplant (BMT). In America, which is like half the size of India, there are 30 to 40,000 transplants in a year. Whereas in India with a mammoth population of 1.3 billion people, we do only 3000 transplants across 60 centers in a year. So, we have a great scope because you require more lives to be saved, that’s why you should opt to become a hemato-oncologist. The career option has to be chosen considering are you ready for the adventure and are you ready for the promptness to dedicate towards saving the lives of blood cancer patients because you require 24*7, 365 days a year commitment to save these blood cancer people. 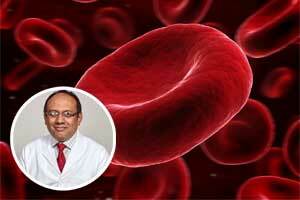 It is hugely growing in numbers and the country needs more and more haematologists. So as a career option you can go through via post graduation in paediatrics, internal medicine or pathology. In AIIMS and CMC Vellore, you require any MD medicine, MD paediatrics or MD pathology for proceeding to DM haematology. In Mumbai, Kolkata you can also do your DM in haematology after doing your MD in pathology. New centers which have really come up is like PGI Chandigarh, which has started a DM pediatric oncology and hematology which has again segregated hematologist into adult and pediatric oncologist, one dealing with patients between age 0 to 18 and other 18 above, that’s a need and that is the need of the hour for practicing medicine with precision. To the youngsters, haematology is a challenging field. Are you ready for that challenge is what one has to think. There are many D.M. centres which have opened up for imparting scientific knowledge of haematology, hemato-oncology, and bone marrow transplant but the choice ultimately lies with you. One can also do DM Hematology after doing MD Biochemistry.